Established in 1978, Chas Stewart Plumbing & Heating Engineers is a local, well established plumbing and heating engineers with the Head Office located in central Perth. Our engineers operate throughout the whole of Perthshire, the Central Belt, all areas of Fife and throughout Scotland. We are registered with Gas Safe, OFTEC, SNIPEF, Constructionline. NAPIT, RECC and MCS in addition to being Gold Accredited Worcester Bosch partners. We are qualified to work with Gas, Oil, LPG, Solar Thermal, Air Source Heat Pumps and also commercial catering equipment. We are accredited under the Renewable Energy Consumer Code, the Microgeneration Certification Scheme and National Association of Professional Inspectors and Testers which are a necessity for undertaking solar and air source system work. Our services including general plumbing work and emergency repairs, bathroom installation, refurbishment, boiler installation, maintenance and repair, landlords certificates and heating installation maintenance and repair. We are also experienced in the design and installation for new build properties and commercial repair and maintenance contracts. We are experienced in the installation and maintenance of solar thermal and air source heating systems. 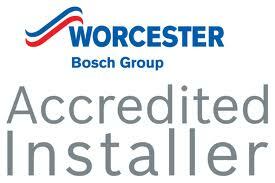 We are a Worcester Bosch Gold Accredited Installer. Click here to have Powerflushing simply explained....or contact us! The Chas Stewart hallmark of quality covers a wide range of domestic work and regular contracts with local and national housebuilders, housing associations, local authorities, public utilities and businesses large and small. Industrial unit developers also trust Chas Stewart to handle all their plumbing needs. We commit to bringing you a superior quality of finish and excellent customer service and assure you of our best attention at all times. "Thank you very much for the work that has been carried out. I am more than pleased with the standard and the helpfulness of your staff". "Your company responded immediately to my request to have new sink taps fitted. When the problem turned into an Emergency, Norman attended within the hour to solve the problem. Thank you all very much." "Quality of work carried out was excellent. Would highly recommend". "Just wanted to say thank you for the great service I got today. The guy in the office couldn't have been more helpful and the plumber who attended was really efficient, helpful and friendly (which is so nice given the number of grumpy people in the world). I would definitely use your service again and recommend you." "I wanted to write and thank you personally for kindly supporting our Opera Evening. It was a great success and raised over £8,000 for Alzheimer's Research"
"Thank you very much for carrying out this work so quickly and efficiently. We are very grateful for the way in which the work was brought forward, and for the kindness and helpfulness that we have received from the firm and its work force at all stages of the process of replacing our heating system"
"I'd like to thank everyone at Chas Stewart Plumbing for a job well done"
"...We are very happy with the work carried out and Charlie was very patient and courteous"
"Your engineer came and fitted our new cooker. He was very patient, courteous and polite. We would use your company again and would happily recommend your company to friends and family". "Charlie did an excellent job of servicing and repairing a fault in the boiler. In fact, our underfloor heating has never worked as efficiently in the 7 years since we have been in this house... excellent communication and service..."
"My wife and I feel I must write to you to commend two of your employees. The professional approach of both Scott and Liam is to be commended. Their cheerful manner and hard work made the upheaval easy to bear. Please pass on our sincere thanks and gratitude to both". "Thank you for the the promptness and efficient way in which the work was carried out. If I require further work I will not hesitate to contact you". "I wish to thank you and your staff for the amazing work you did when you put in my shower - yourself, Gary, your apprentice Ben and the rest of your workers. Thank you all. I'm very glad it was yourselves that did the work for me. I can only say thank you all so much. The work was amazing..."
"Hi just wanted to thank everyone for the excellent service I received. I would have no hesitation in recommending you. Everybody so professional and friendly, Derek".
" Thank you for a great service and all your help"
"Your firm did a First Class job and the installing plumber was excellent. I have already recommended your company to a couple of neighbours who are going to change their boilers after the summer". "Your engineer Paul is a very hard worker and his work is both neat and tidy. Very impressed..."
"The service you have provided has been exemplary"
"Just a quick note to thank you for a very clean and tidy job - very good plumbers. Charlie was especially very professional and efficient and explained everything in an easy understandable manner."